Creativity and oddity are two best friends. That’s why artists, musicians, writers or other creative beings often have a range of unusual habits. On the one hand, you could leave all these extraordinary artists alone and live your normal life. On the other hand, you could take a closer look, changing your attitude from thinking they are weirdos or eccentric, and make use of some of their creative practices. Before you start reading the post, you can check how Maria Popova in her blog Brain Pickings soundly described odd habits and curious customs of the famous writers and presented an amazing infographic about the wakeup times of the famous writers. The other group of writers loved “vertical writing.” Virginia Woolf practiced it, as well as Vladimir Nabokov, who also mixed it with lying on his bed. Charles Dickens as well as Henry Miller traveled all over Europe searching for inspiration and trying to escape. As psychologists say, sometimes you need to get lost and be on your own in order to restore your productivity and have an appetite for life again. One’s best time for work is quite subjective. You know how it works – there are morning or night people, Monday or Friday people. 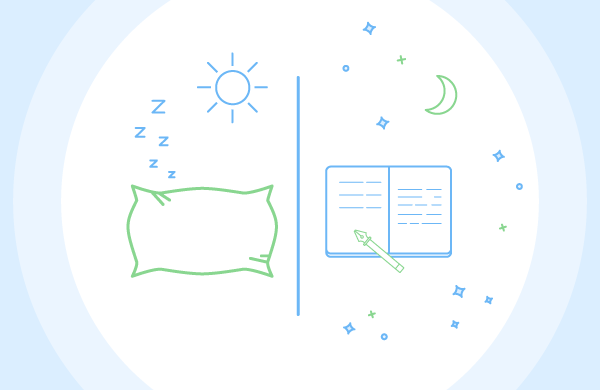 Follow your biorhythms, sleep well and work during your most convenient time for productivity. Sylvia Plath, Ernest Hemingway and Kurt Vonnegut preferred to work early in the morning. Honore de Balzac woke up at night and started to write. Flannery O’Connor woke up early and spent only about two hours a day, as she was getting exhausted because the process of writing clearly exhausted her. In addition to time limits, writers usually have word limits too. For example, Jack London wrote 1,000 words every single day. Or Stephen King tries his best to write up to 2,000 words. Strangely, it’s important for him to write in an adverb-free style. There is the other example: James Joyce found it okay to write a few sentences a day. These sentences, however, had to be great! It’s always a good idea to use different means for organizing your work, such as several workbooks, pens of different color, highlighters or bookmarks. Virginia Woolf wrote mainly with purple, green and blue inks. Lewis Carroll used to be an Oxford teacher and used purple ink when checking students’ papers. He continued this habit even when creating drafts of his writings. Vladimir Nabokov used an interesting card technique: he wrote parts of the text on index cards so he always had the option of changing their order. Alexandre Dumas used different colored papers: blue paper for fiction, yellow for poetry, pink for articles. What a perfectionist! John Steinbeck kept twelve pencils on his desk because he usually created manuscripts with pencils. Spartan conditions were perfect for Victor Hugo. He didn’t want to digress from writing and asked others to put him under house arrest for months. He was even deprived of clothes! His clothes were taken away. With only a bed covering, he had to stay at home. How could he go out looking like that – wrapped up in a bedspread? Perhaps one of the most important things for good writing is finding a convenient place in which to write. The idea of “convenient” differs immensely, though. Vladimir Nabokov and Gertrude Stein liked to write in a car. And now imagine this: Walter Scott wrote poetry on horseback. Check out our infographic about unusual jobs of famous writers and get inspired by the stories of Kurt Vonnegut, J.D. Selinger, Jack Londin and others. Do you find any of these writers’ habits interesting and worth sharing? Use the super-easy share buttons on the left!